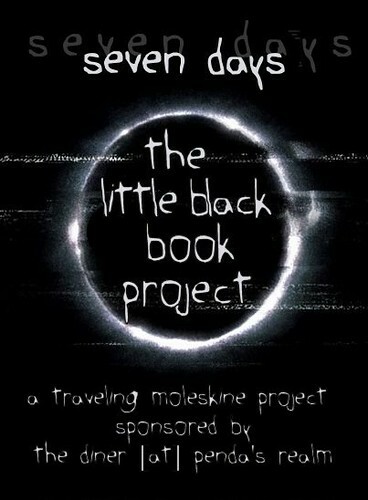 The Little Black Book Project (Moleskine) at The Diner [at] Penda’s Realm - Cookies - the coin of Penda’s Realm. Published by MontiLee August 29th, 2006	in Moleskine Project. On Thursday, August 31, 2006, the Moleskine will begin it’s journey - of course - with me. The maximum you can keep this book is 7 Days. You get the book and e-mail me: montilees [at] gmail [dot] com so I know it arrived. Please don’t cheat it so you have extra days. Then you carry it around with you, jotting down stuff, drawing pretty pictures, slipping in newspaper clippings - whatever - for up to 7 days it’s yours. Take a picture of it - scan a page - something to send to me to show that you made your mark, then you put it back into the mail. The only difference will be when we get to porknbeans. Since I’m the originator of the project, I’ll kick in the funds to ship it overseas. Just let me know before you ship it out so we can track her down and get it shipped properly. She gave me a whole laundry list of requirements to sending it out to her, and it could be several weeks before it starts its journey again. It can either come back to me or zahirahblue can send it - as long as it goes, it doesn’t matter to me. As scans come in, I’ll post them and inform the group of where it is. Very excited to get started. You’re the only one participating who doesn’t have a LJ account.